FRAMINGHAM, Mass., July 31, 2018 – According to preliminary data from the International Data Corporation (IDC) Worldwide Quarterly Mobile Phone Tracker, smartphone vendors shipped a total of 342.0 million units during the second quarter of 2018 (2Q18), resulting in a 1.8% decline when compared to the 348.2 million units shipped in the second quarter of 2017. The drop marks the third consecutive quarter of year-over-year declines for the global smartphone market and only the fourth quarter of decline in history. IDC believes this is the result of churn in some highly penetrated markets, although many high growth markets still exist and should return smartphone shipments to overall growth. The arrival of Huawei in the second position marks the first quarter since 2Q10 where Apple has not been the number one or two smartphone company in terms of market share. Huawei delivered shipments of 54.2 million units to move into the second position with a record high market share of 15.8%. Samsung maintained a comfortable lead, although indications from its recent 2Q18 earnings call suggest its mobile division revenues will face challenges moving forward. "The continued growth of Huawei is impressive, to say the least, as is its ability to move into markets where, until recently, the brand was largely unknown," said Ryan Reith, program vice president with IDC's Worldwide Mobile Device Trackers. "It is worth noting that Apple moved into the top position each of the last two holiday quarters following its product refresh, so it's likely we'll see continued movement among the top ranked companies in 2018 and beyond. For most markets, the ultra-high end ($700+) competition is largely some combination of Apple, Samsung, and Huawei, depending on the geography, and this is unlikely to change much in the short term. At the same time, Xiaomi, OPPO, and vivo are all slowly pushing their customer base upstream at a price tier slightly lower than the top three. This is an area they should all watch closely as the builds in this segment are getting increasingly more advanced." 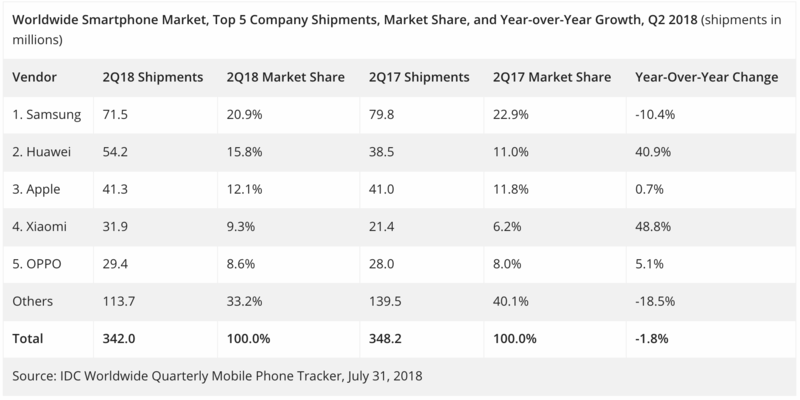 "The combination of market saturation, increased smartphone penetration rates, and climbing ASPs continue to dampen the growth of the overall market," said Anthony Scarsella, research manager with IDC's Worldwide Quarterly Mobile Phone Tracker. "Consumers remain willing to pay more for premium offerings in numerous markets and they now expect their device to outlast and outperform previous generations of that device which cost considerably less a few years ago. To contest this slowdown, vendors will need to focus on new innovative features and form factors combined with incentives and promotions to drive growth in many of these highly competitive markets moving forward." Huawei surpassed Apple for the first time to move into the second position based on global market share. It continues to lead the China smartphone market with a record-high market share of 27.0% in 2Q18. In the first half of this quarter, Huawei's P20/P20 Pro series found strong demand in the $600-$800 price segment, helping Huawei build a high profile in the market. In the second half, with the release of its "GPU Turbo" technology, Huawei continued to earn a good reputation. 618 promotions led to strong sales for Honor models in the online channels as the Honor brand continues to be a key driver of growth for the Chinese tech giant. Xiaomi has pulled ahead of Samsung for the number 1 position in India over the past few quarters and has now closed the gap with Samsung in Indonesia as it ramped up its local production to address the increased demand during Ramadhan period, while also expanding its online channel presence and opening up more Mi home stores in the country. OPPO faced a slowdown in key markets like India and most of Southeast Asia as it eased back on its aggressive marketing and sales activities in the region. Despite this, the company still managed to grow 5.1% over last year as it continued its expansion into other markets such as the Middle East & Africa. The recent launch of the Find X has also garnered Oppo some praise as the innovative, bezel-less and notch-less design has grabbed the attention of many.